When I worked for Hillel at Towson University, I was recruiting for a free trip to Israel and wanted to use Facebook ads to recruit people to sign up. 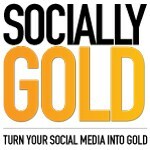 This time, I set money aside and was going to use Facebook Ads again to build Likes on the SociallyGold Facebook Page, but I came up with a better way to use the $50 I instead. I had already invited all my friends to my page, and it only garnered 130 likes, I spent a couple of weeks figuring out how to get more likes. I have been weary of spamming people or asking my friends to post to their friends, etc. I recently started my work as a Social Media Specialist for a Property Management Company and have 40 properties in my portfolio across the country. My team and I have been struggling with getting Likes on each page so we asked for an allowance of $50 per property to run a Facebook contest. You may not know this, but you cannot use Facebook Functionality to run a contest. “The image with the most likes will win x”, “Comment on this status and be entered to win y” are not allowed according to Facebook’s policy, which can be found here, under the “Promotions” heading. What does this mean, how are you supposed to run a contest? There is a Facebook app for that! My team member at work came across an app called Offerpop. Their Tagline is “Run engaging, viral promotions on Facebook and Twitter in minutes.” They have many contest options, but the one I used requires users to sign up in order to enter the contest, and in order to sign up, they MUST Like the page first, which is known as a Fan Gate. Those who Like your page will see a different screen then those who don’t. If you don’t like the page, this is the screen you get, prompting you to Like the page in order to participare. This is the page you see once you Like the page, and it allows you to register for the contest. Offerpop allows for two fourteen day trial campaigns/contests, which after that you will have to pay for their services. Their Facebook App provides reports which provides CTR (Click Through Performance) and populates the names of those who have entered. This particular contest will end on June 22nd and the winner will win $50 and be featured on SociallyGold as the first contest winner! How did I get the word out? I created a Facebook event and invited all my friends with details of the contest! You can enter the contest here and you are allowed one entry per 24 hours. IF YOU REFER PEOPLE TO SIGN UP FOR THE CONTEST. YOU GET AN EXTRA ENTRY!